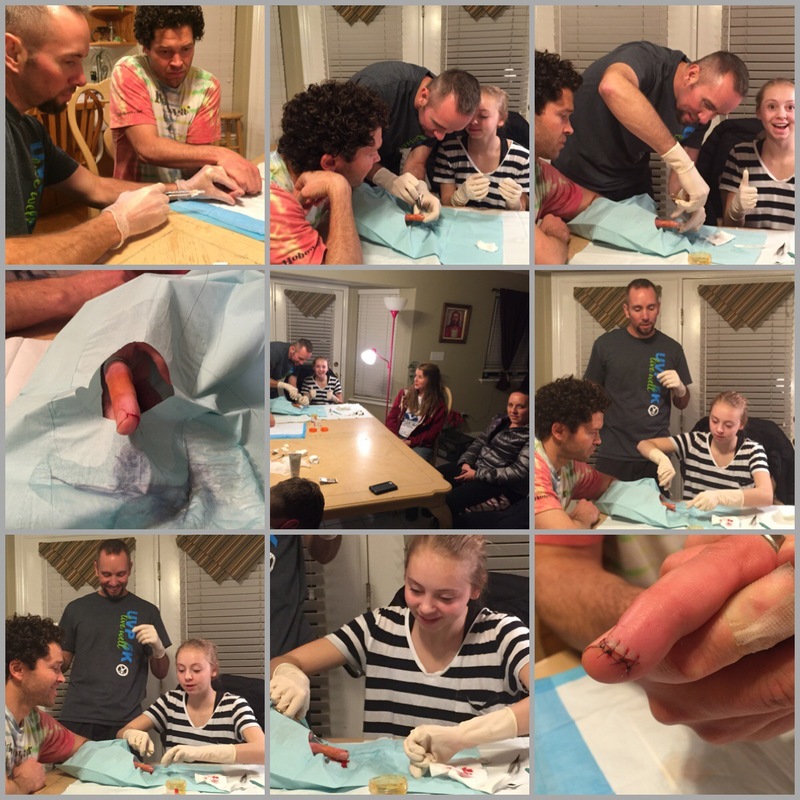 Polar Plunge Fail W/ Cuts & Bruises; Stitches & Fun… Starting Off The New Year Great! Friday Jan 1st: New Years 2016!!! 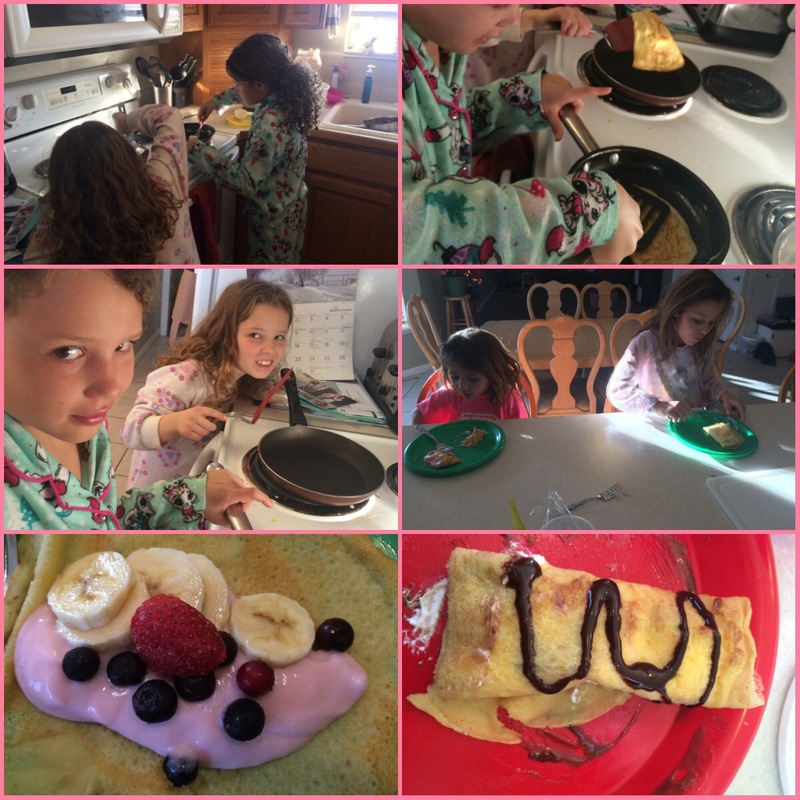 We started of the New Year great… We eventually got up around 7:30ish and made crepes. 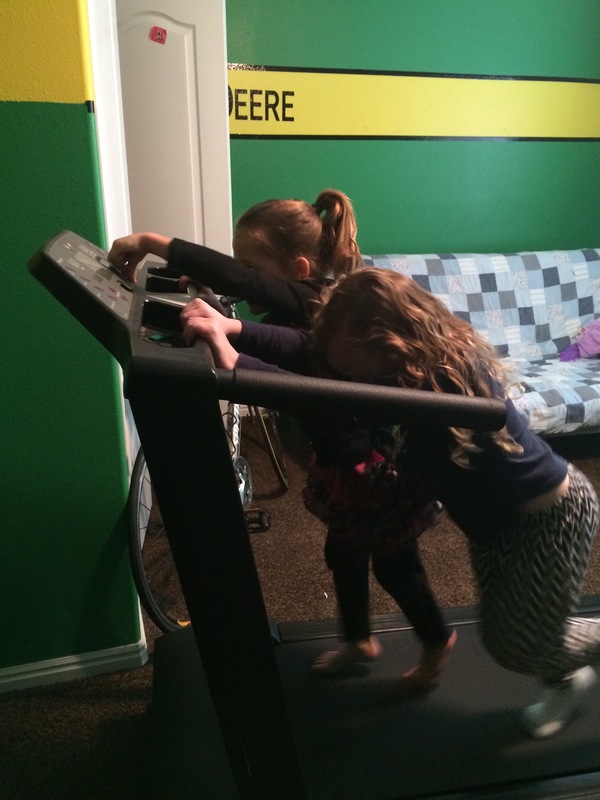 My 2 older girls wanted to help. They were actually very helpful. I waited a little while before I went out for a nice little 40 min run. It felt great! Overall it was a day of hanging around the house with neighbor kids over. 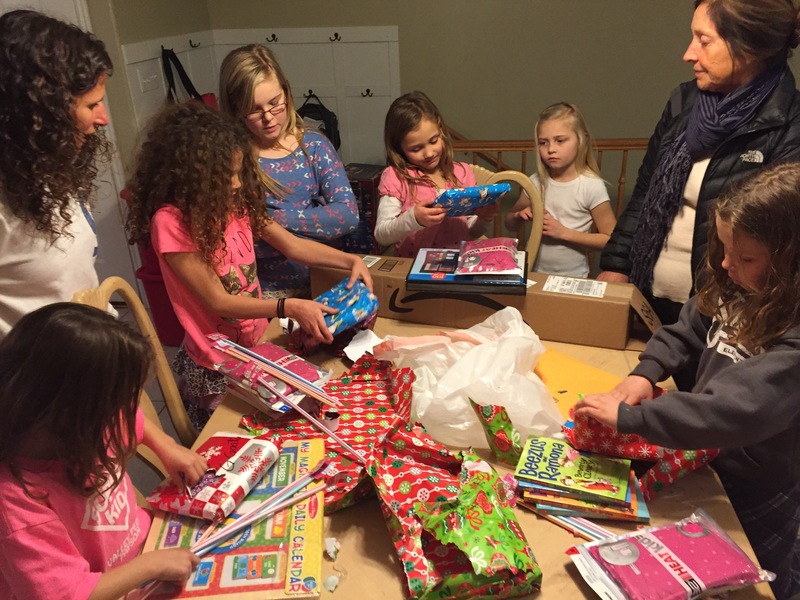 My mother in law came over with presents for the girls. They were loving it! As you can see, he didn’t quite make that water hole he was hoping to slide into (like a seal). It was a little ok a lot painful. 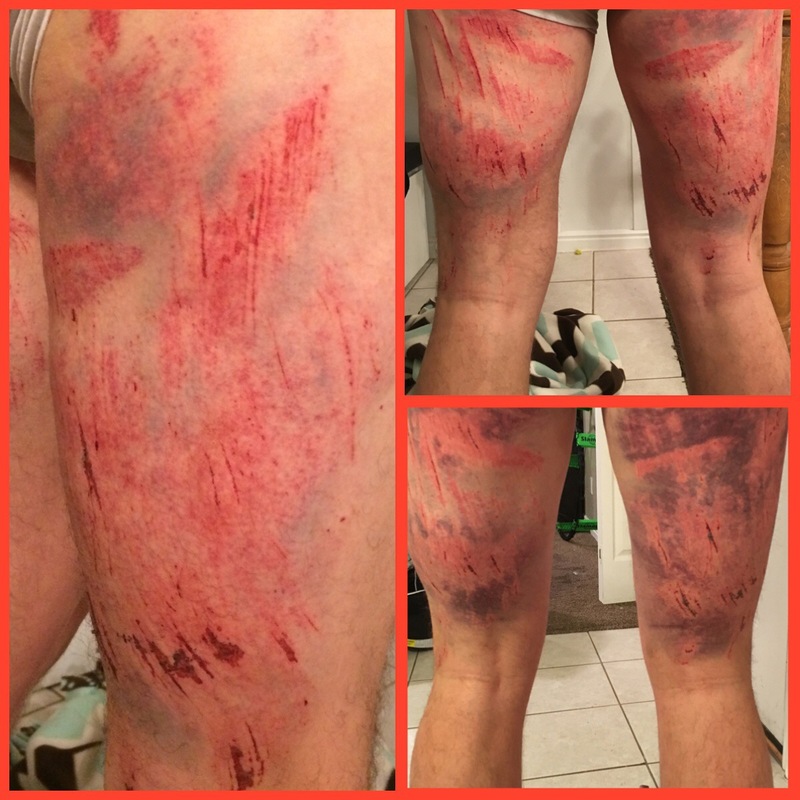 He thought the pain was from the cold but shortly found out that the pain was from all the ice cutting his legs. 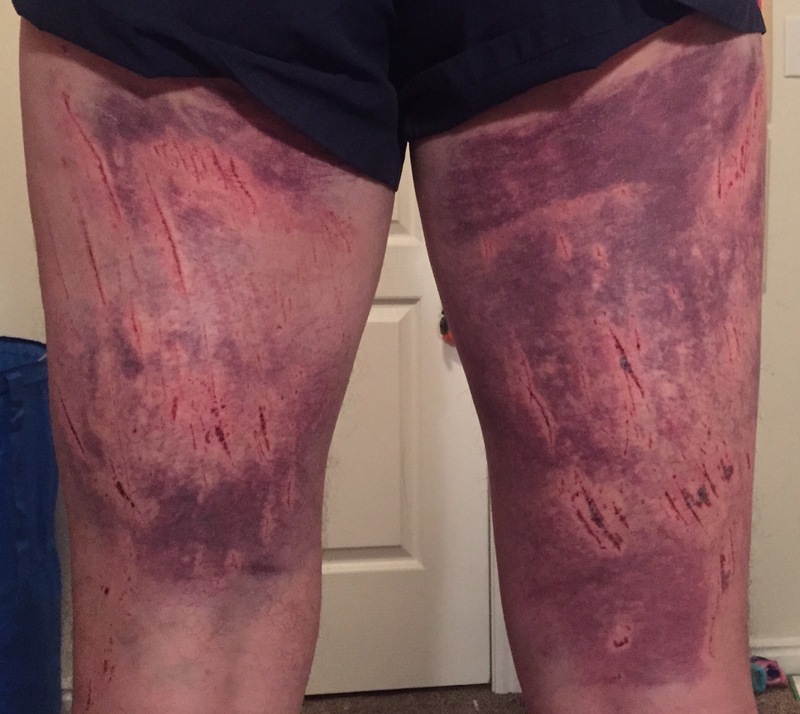 😜 Shortly after coming home, his legs began to swell and bruise. I’m not that unsympathetic but I was rather entertained by this whole Corom experience. I did laugh many, many times! 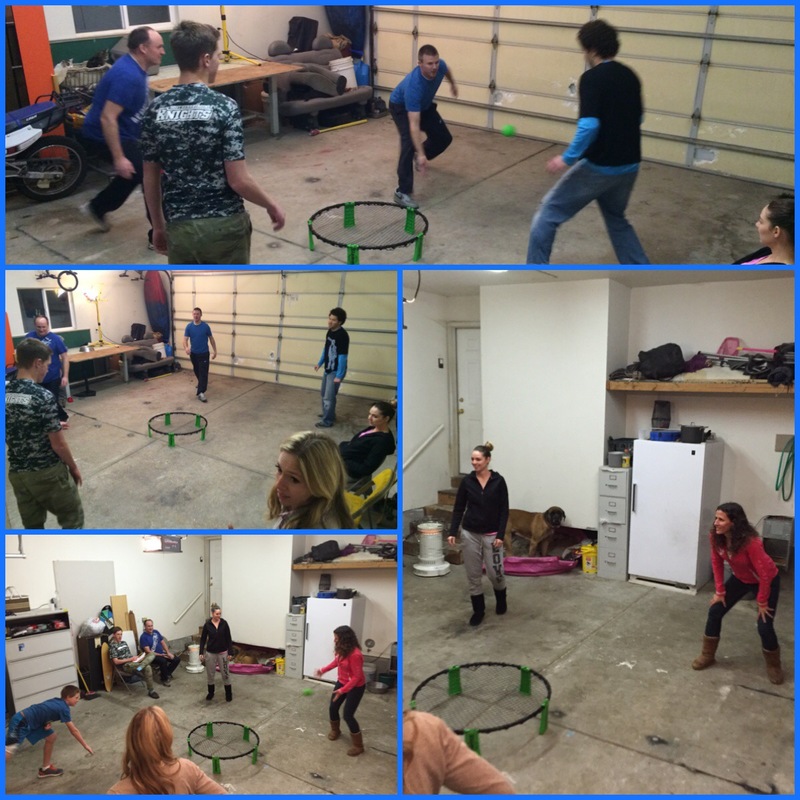 We had a couple of families over tonight and played Spike Ball… It was so fun. Corom was funny to watch but he somehow still managed to play well; he even threw in a few dives. We went to church today… Corom had a hard time sitting down. Once again… A little entertaining to watch. 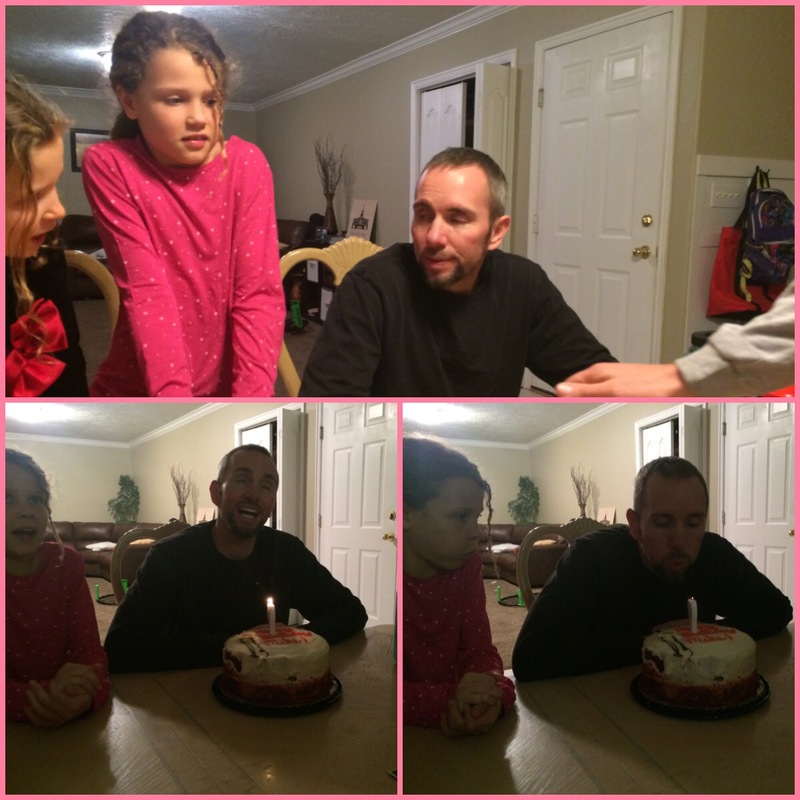 We had the Fullmer’s over for dinner and then celebrated Mike’s birthday. Always a good time. I went out on RS visits in the evening… And then we all went to bed early. 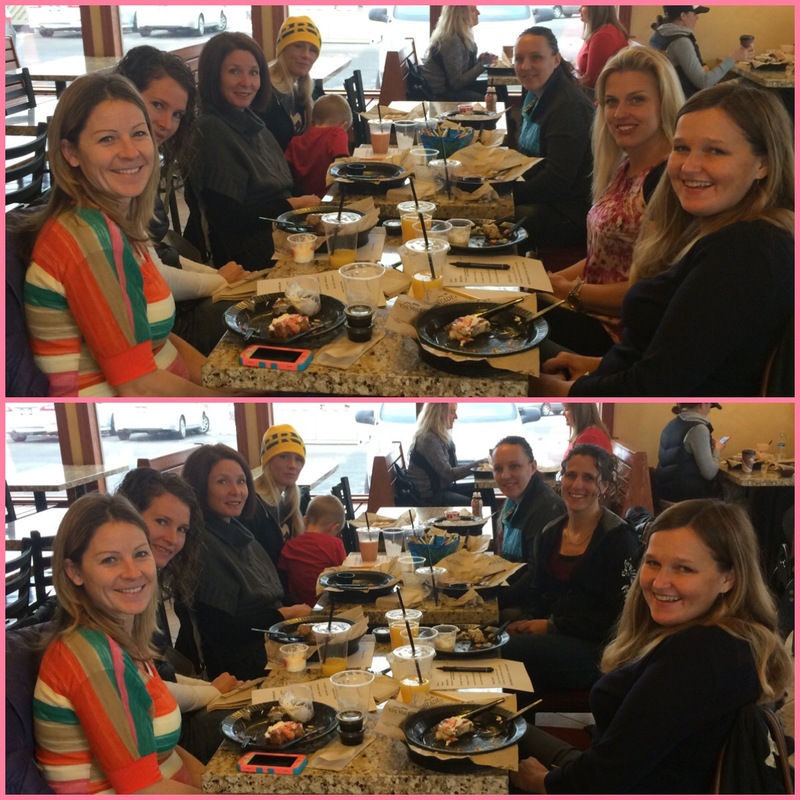 Monday Jan 4th: After the girls went to school, I headed over to Kneaders for our PTO meeting. It was nice to have our meeting over breakfast. Great group of ladies! I ran for 30 min on the treadmill (1st time in so long)! Then my youngest wanted to run too. I coached the HS kids at in-door track today. 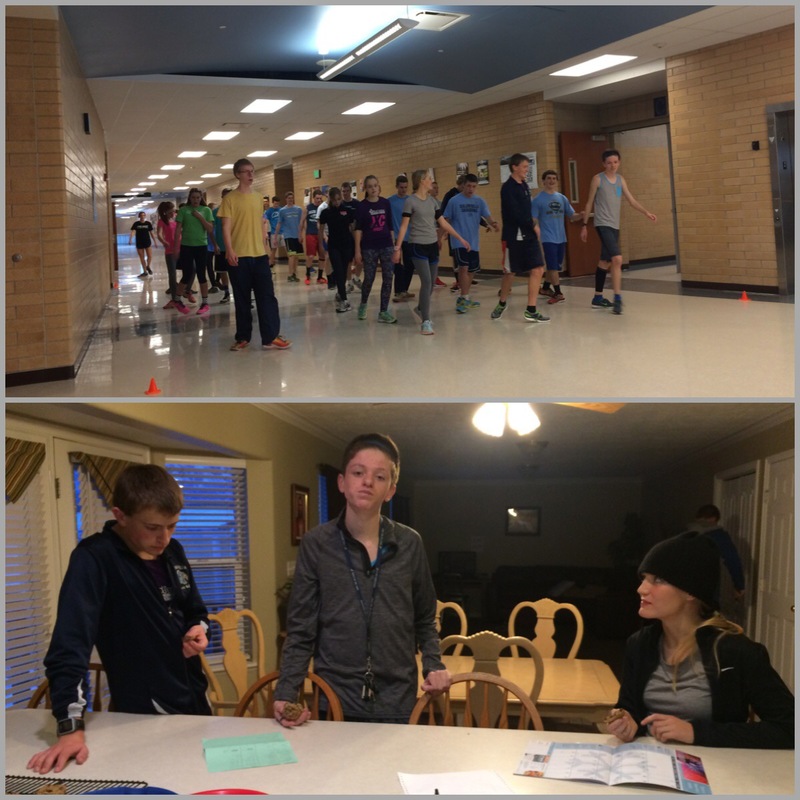 The distance runners start inside but then end up outside. 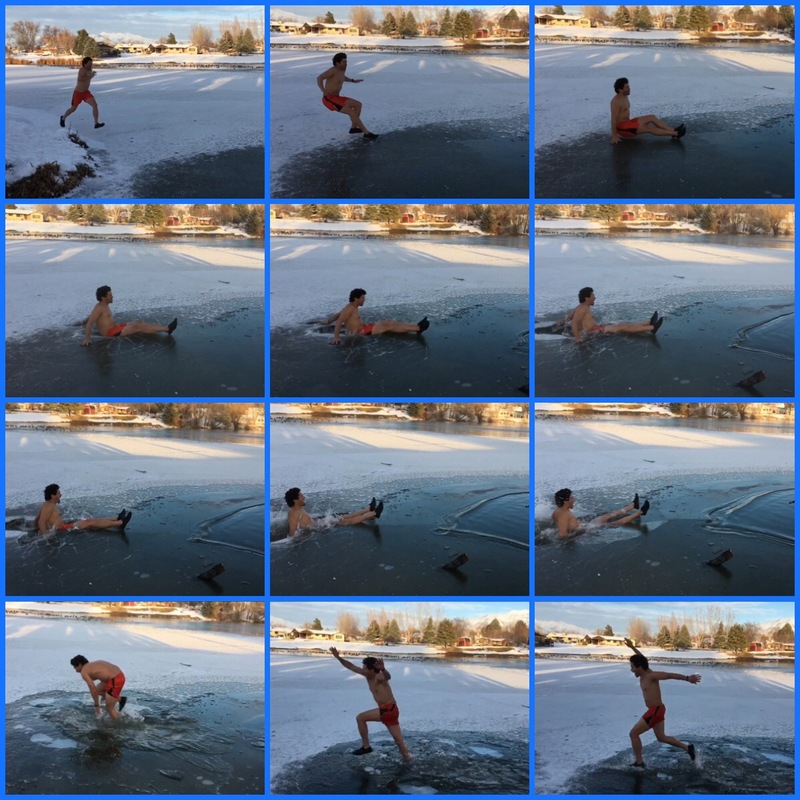 It was a little chilly out… I don’t know how some kids do it without warm clothes on! 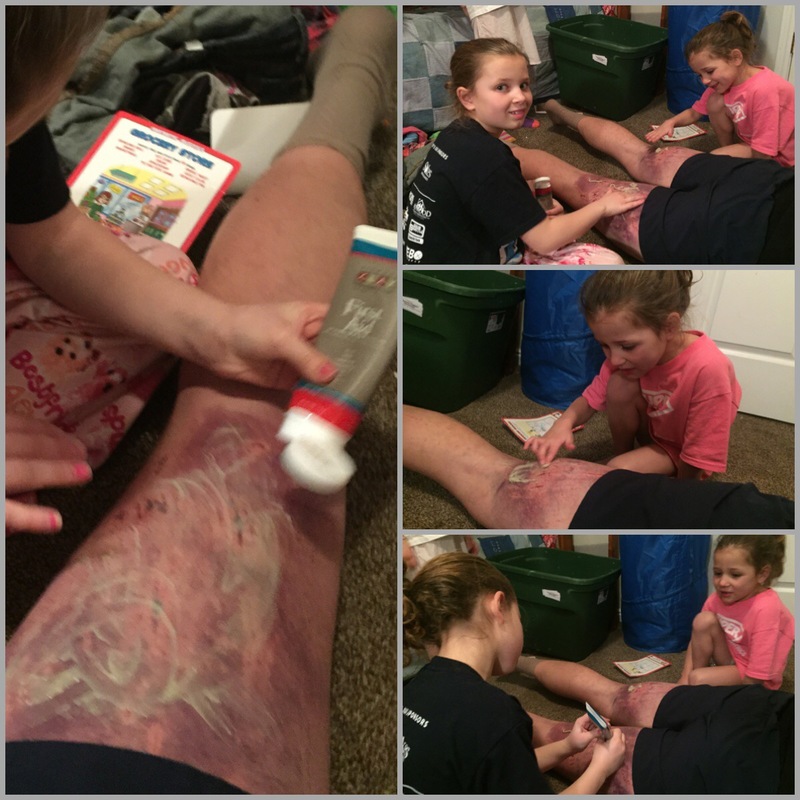 We had family night and then during their bedtime story (I’m reading Harry Potter to them), my 2nd daughter and 4th daughter rubbed some “mud” medicine on Corom’s legs. I’m glad they wanted to do it because I didn’t! 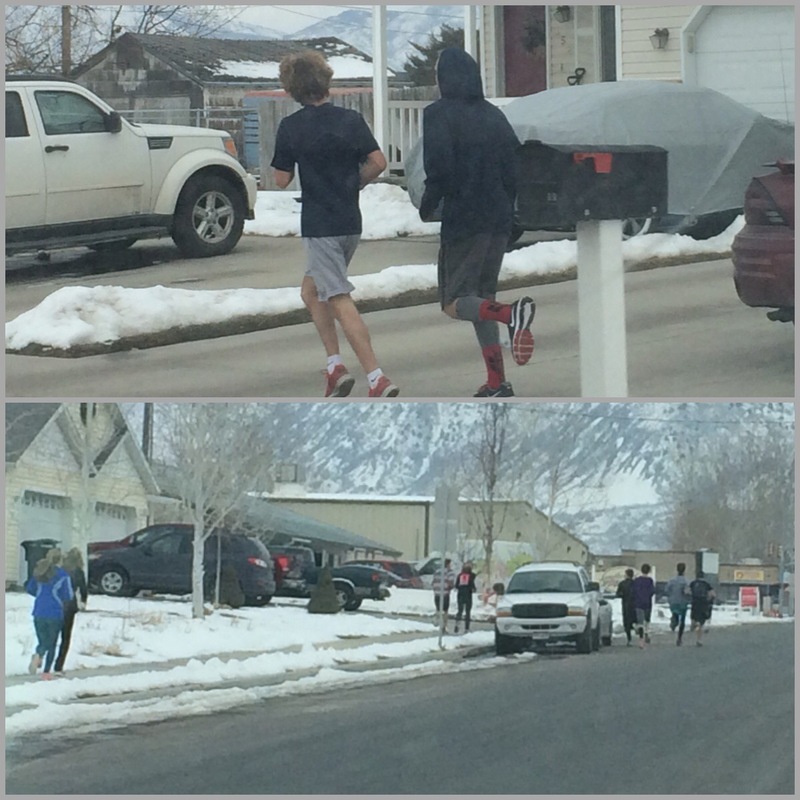 Tuesday Jan 5th: I went on a run after I dropped the girls off at school. It was an easy 8 today. I have been loving the sleeping in and running when the sun is out! Not a whole lot today. We had track practice and then the HS kids came over for cookies. We had the Barney’s over for dinner, then Corom and Travis headed to their church meetings; Megan and I and the kids ran some treats to a neighbor’s house. 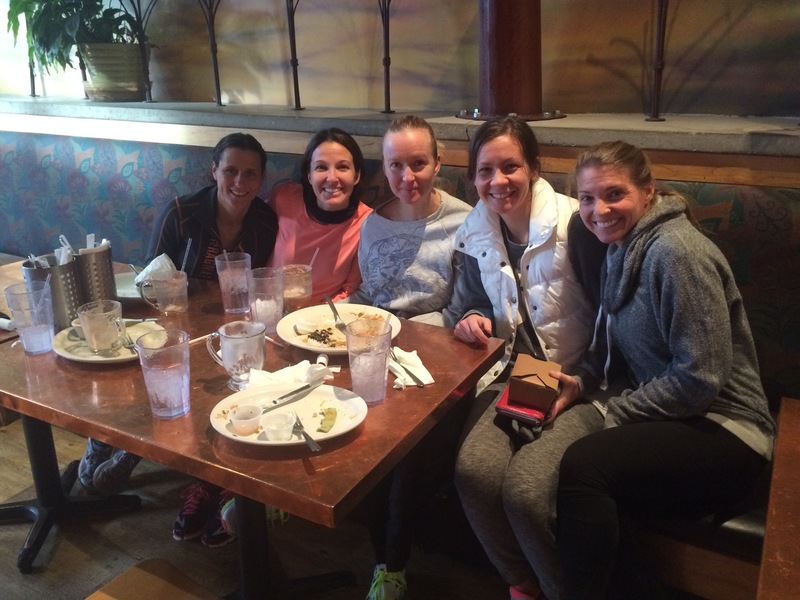 Wednesday Jan 6th: I went out for a 5 mile run… I ran straight to a Yoga class (my 2nd one ever). It was so great! It was tough and I am not flexible at all but really good. Amber (the instructor) was so good. After yoga I ran 3 more miles. Corom sliced his finger pretty good. 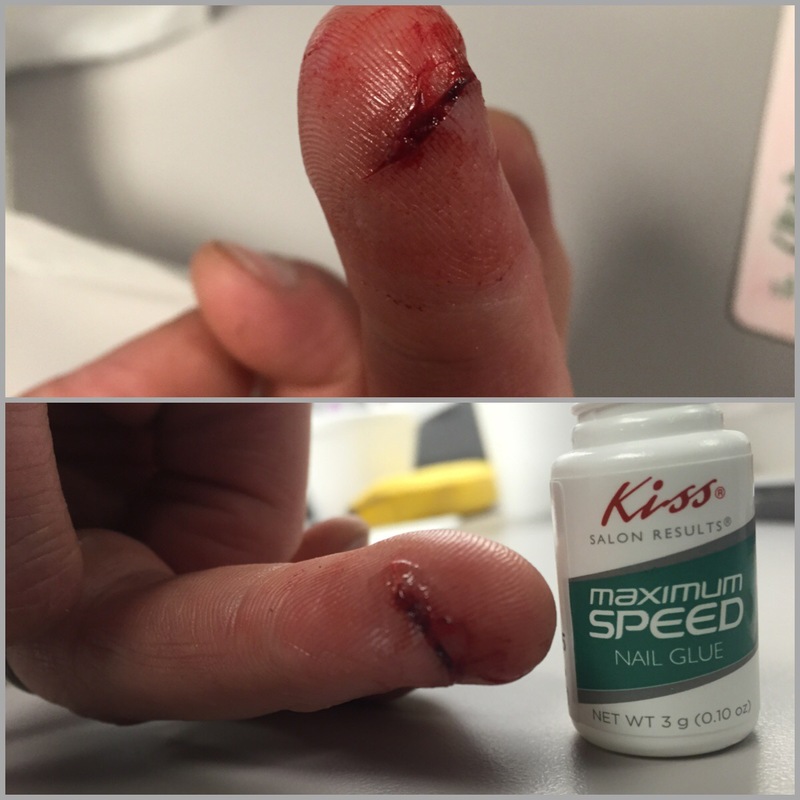 It needs stitches but he super glued it together… (Which you will see he will get stitched up later 😁). The girls had piano lessons today, Corom had to work late, and I went on RS visits. 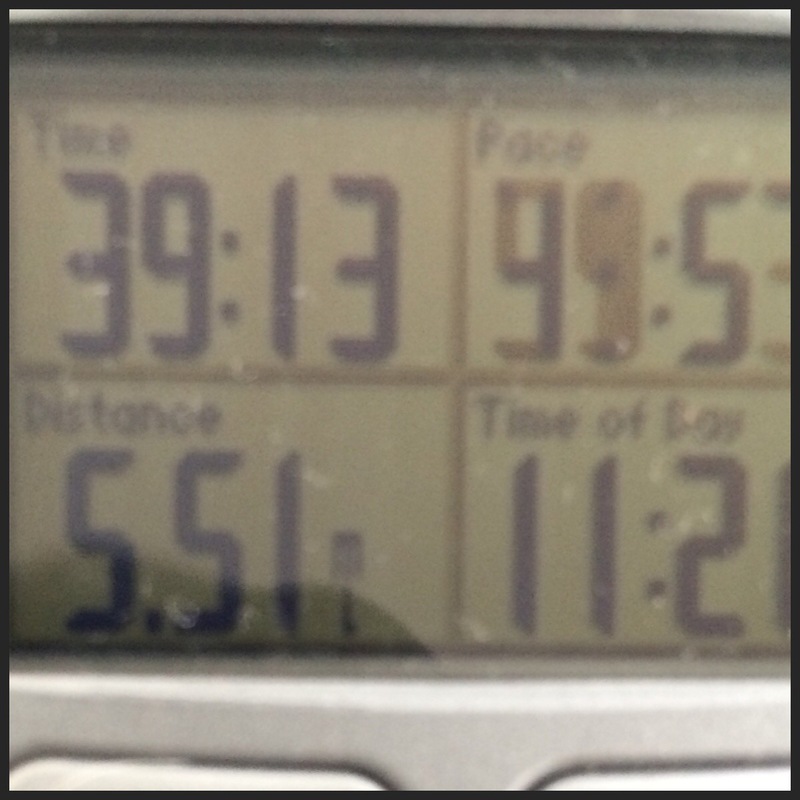 Thursday Jan 7th: I didn’t run today but I did go to the gym for an “Insanity” workout… Whatever that is. It was a 23 minute workout with rowing, lunges, burpees, sit-ups, etc. I wasn’t sore until the next day. It has been a long time since I have done upper body or a core workout. That’s my problem… I usually only run. My friend Camile and her kids came over for lunch. 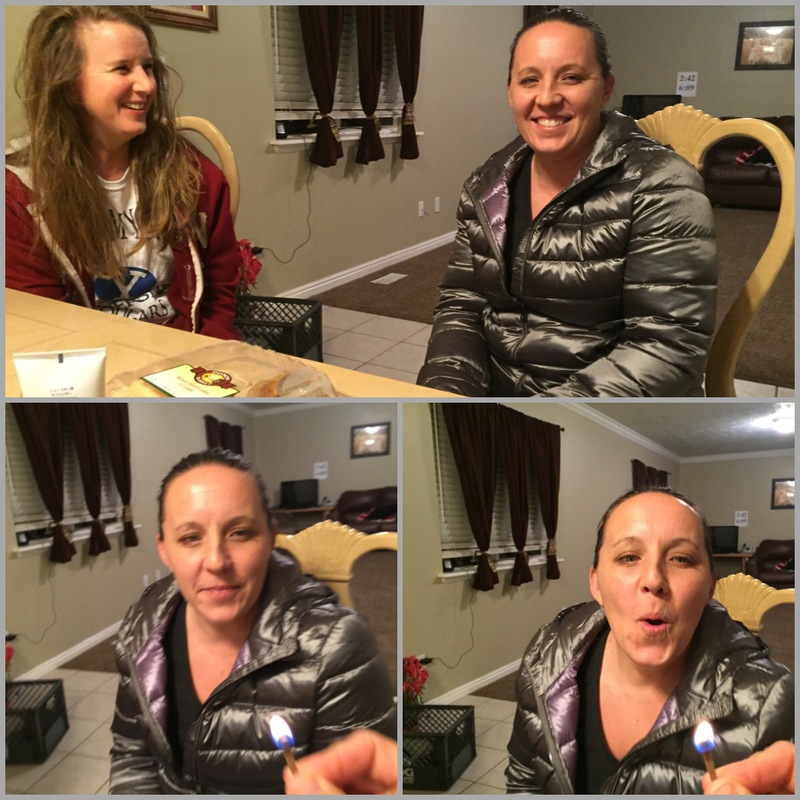 It is her bday today… It’s always nice hanging out. My youngest was the only one that went with me to track practice today. 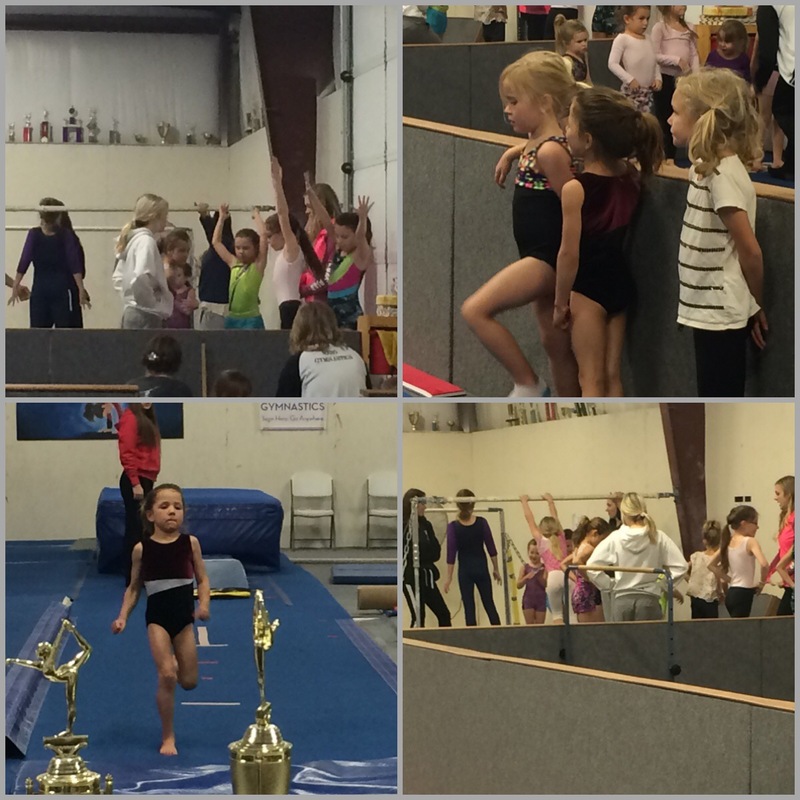 Then the girls had gymnastics tonight. They are loving it! I had a church RS thing tonight. We listened to Mary Cook speak (which was excellent) and then I headed home to watch Corom get stitched up. 😁 Mike Fullmer brought some stuff over and got to work. It still makes me cringe just writing a bout it. His daughter did help with the stitching… She did a pretty good job. 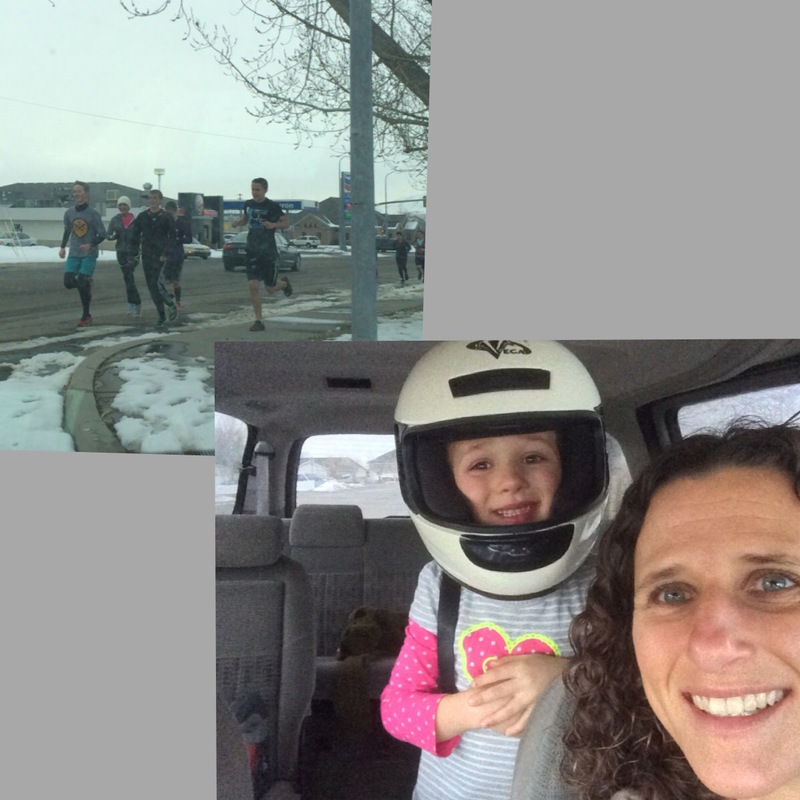 Friday Jan 8th: I went out on a 8 mile run after the girls were dropped off at school. 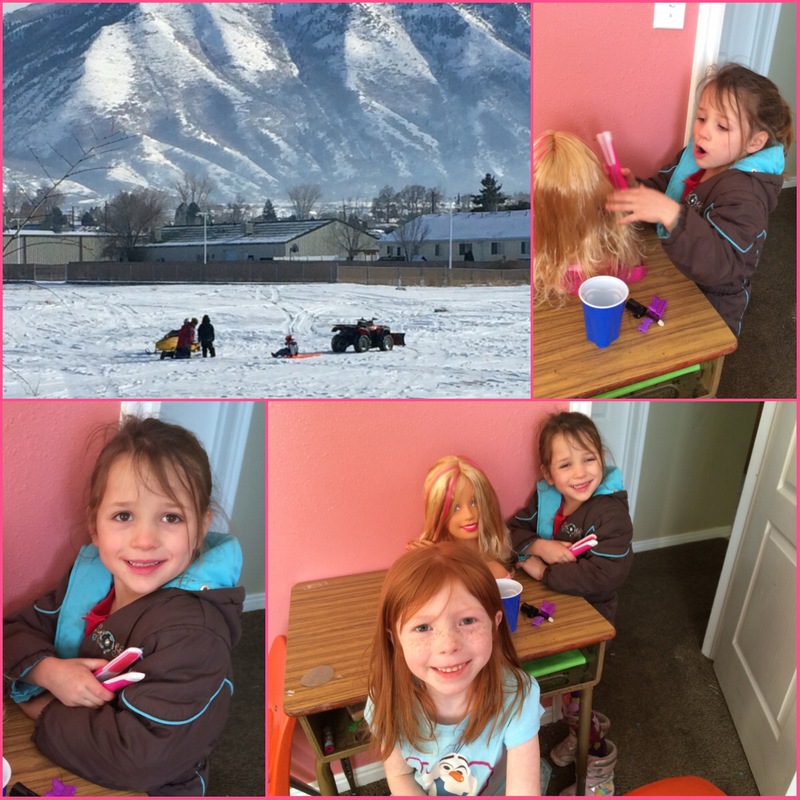 My youngest and I watched a movie together today (when she got home) and then hung out with a neighbor. 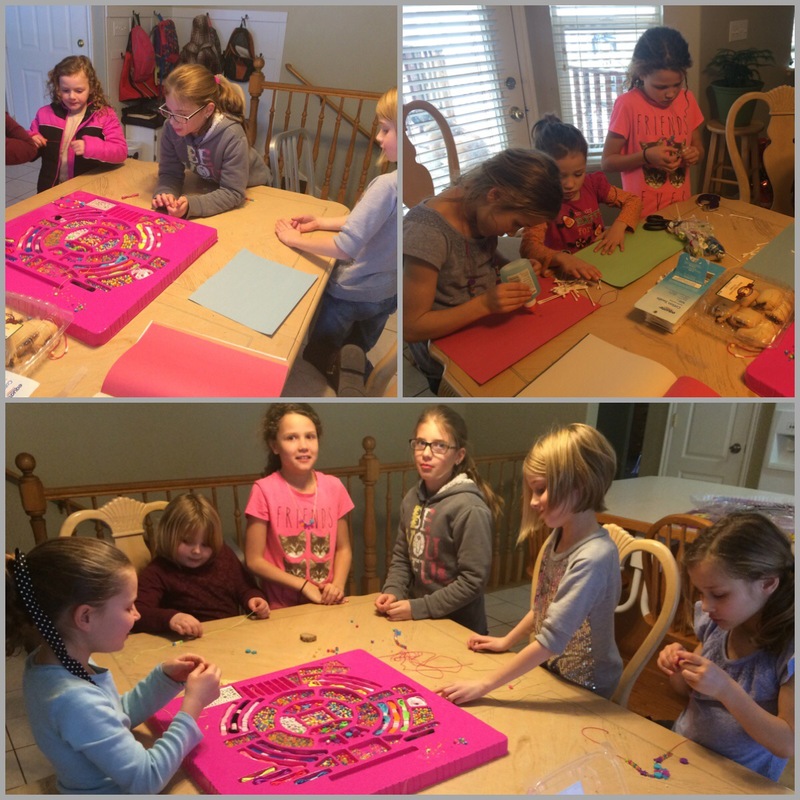 The girls had friends over… We had a “craft” day. It kept them all busy for a while. 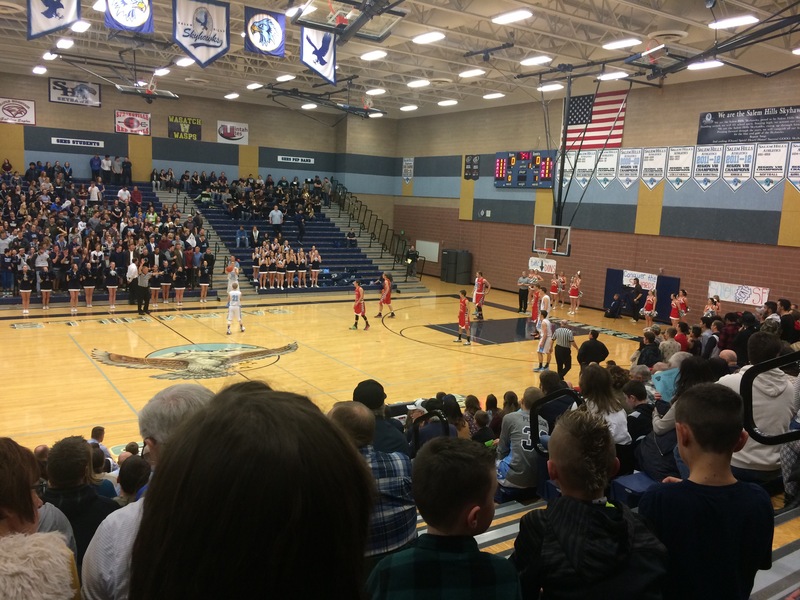 We met up with the Barney’s at the HS basketball game (my girls enjoyed it). I slipped away for a little while to go play basketball myself at the church. They put together church ball games for the ladies. It was good exercise… I’m not that good at it but I enjoyed it. We watched movies all night when we got home… We stayed up way too late!! Whoa! What a week! I cannot get over Corom’s legs. That sounds so inappropriate! haha When I was in H.S. I had friends over and my parents had a new jacuzzi. I thought it would be a good idea to jump into the snow and jumped into a pile knee first, holding my feet. Dumbest idea ever, there was a layer of ice under the snow. My knees were a torn up mess for a long time. And then the stitches to the hand?! I hope this week is better for him! Haha… You sound just as bad as Corom! Hope things are well with you guys!